As your school or district makes the transition to digital learning, it's important to identify and support students both inside and outside of school. Not only do issues of digital equity create challenges in schools and classrooms, but educators and administrators also need to consider who may have difficulty accessing digital devices, the Internet, and/or digital learning supports when they leave school grounds. 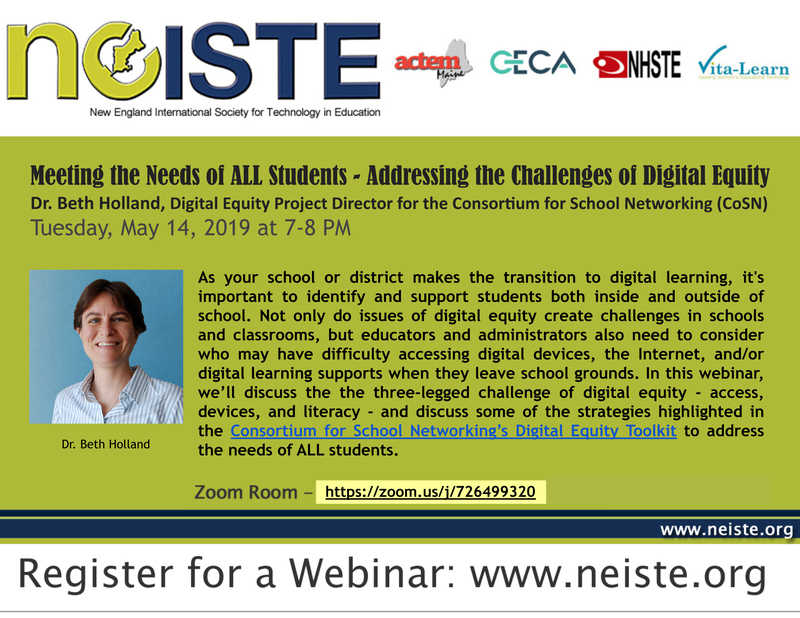 In this webinar, we’ll discuss the the three-legged challenge of digital equity - access, devices, and literacy - and discuss some of the strategies highlighted in the Consortium for School Networking’s Digital Equity Toolkit to address the needs of ALL students. Dr. Beth Holland is a postdoctoral research fellow at the University of Rhode Island as well as the Digital Equity Project Director for the Consortium for School Networking (CoSN). Over the past 20 years, she has taught in K-12 classrooms, served as Director of Academic Technology in a PS-8 independent school, designed professional learning programs for schools around the world, and developed leadership programs to support systemic change. Additionally, she is a prolific writer, researcher, and speaker. Dr. Holland holds an Education Doctorate (EdD) in Entrepreneurial Leadership in Education from Johns Hopkins University, a Master's degree (EdM) in Technology, Innovation, and Education from Harvard University, as well as a Bachelor of Science (B.S.) degree in Communications from Northwestern University.